Samsung Pay is will land later this year, first in the US and South Korea but pretty soon to the UK and the wider world too. Samsung Pay is coming to South Korea on August 20, the US on September 28 and plans to roll out the service in the U.K., Spain and China, with 'partners to be named in each market'. The main thing that Samsung has over the rest of the competition is that its Pay service can work with nearly any card terminal the world over, thanks to the clever inbuilt technology. The phone can emit the same NFC signal as other contactless cards (and in a similar way to the Apple Pay mechanism), which means it'll be on a par with Android Pay too when that launches. However, the clever bit is when you approach a terminal with no contactless technology baked in. Most, if not all, will still have a magnetic stripe reader on the side or bottom, and the Samsung phone will be able to discern this and emit the correct signal to mimic a swipe. This effectively turns any terminal into a contactless payment system, requires no sign up from the merchant and gives Samsung phones a real leg up in the way for mobile payments. The only question is whether this is enough to encourage people to actually buy Samsung phones - that's a question for another time. The Samsung Galaxy S6 Edge and Galaxy S6 will both support Samsung Pay at launch, with the Samsung Galaxy S6 Edge+ likely to be the posterchild for the service given its launch proximity to the service. 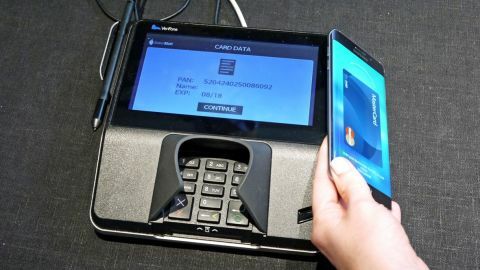 Annoyingly, Samsung Pay won't be too far backwards compatible - so even phones with the necessary NFC reading skills won't be able to take part. The NFC side of things with Samsung Pay is one of the simplest out there. Holding your finger on the home button - with the phone screen turned on or off - will activate Samsung Pay and you'll get a list of your cards to swipe through - your chosen default card the first on that pops up. After that you'll be asked to hold your finger on the sensor to authenticate the payment system, and a swift tap to the terminal will have the payment over and done with in seconds. It's not as slick as Apple Pay though. That system senses that an NFC terminal is coming, loads your card for you, and a tap of the TouchID button will have you paying in no times. That's the way I expected it to happen, but there are few more swipes to activate the system with Samsung Pay. The reason for the extra swipes, and the phone's inability to fire when an NFC terminal is near, is possibly due to the internal failsafe to ensure you don't pay twice for your goods. The magnetic stripe signal works in a similar way to NFC, but is a 'passive' system, meaning the magnetic stripe reader doesn't emit a signal in the same way. So when you activate Samsung Pay, the phone will firstly search for the NFC contactless signal, and if it's not found, will default to the magnetic strip version. Trying the magnetic strip method proved a little more problematic, taking a few more taps to make sure the terminal registered the phone. This is likely to cause embarrassment in shops when using the system for the first time, which is not what Samsung wants when trying to convince the world its payment system is ace. Samsung Pay has one big selling point: near-universal compatibility. You'll be able to use it on nearly any terminal, and that's a bit draw if you're a fan of mobile payments. Except, well, nobody is. No-one is going to buy a phone just because the payment mechanism is great - but it will give that 'user delight' moment that matters so much to big brands. The moment when you find out your S6 can navigate you through town and buy items for you is a great one - although we're still waiting to find out if there's a payment limit on the magnetic stripe method of payment. Samsung Pay seems superior in functionality to anything else out there, but it's a little more fiddly to use - whether that will matter when users already have the phone remains to be seen.